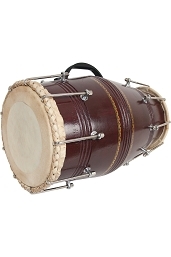 The Dholak sometimes (dholaki or in Suriname & Holland dhool) is a North Indian, Pakistani and Nepalese double-headed hand-drum. 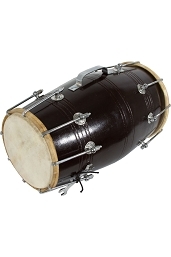 It may have traditional lacing or turnbuckle tensioning: in the former case rings are used for tuning, though the dholak is mainly a folk instrument, lacking the exact tuning of the tabla or the pakhawaj. 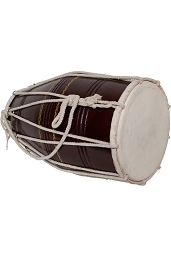 It is widely used in qawwali, kirtan and various styles of North Indian folk music. It was formerly much used in classical dance. The drum is either played on the player's lap or, while standing, slung from the shoulder or waist. The shell is usually made from sheesham or shisham wood (Dalbergia sissoo). 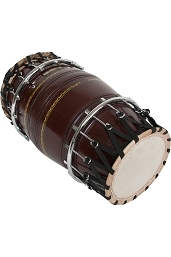 The process of hollowing out the drum (its resultant shape and the surface of the drum's interior, whether left rough-hewn by a drum carver or carefully smoothed) determines the tone quality of a dholak.